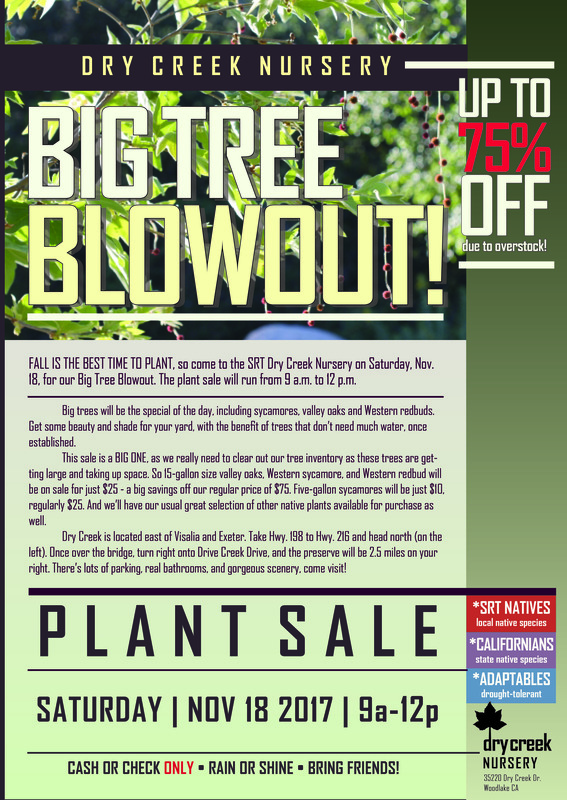 Fall is the best time to plant, so come out to the SRT Native Plant Nursery's sale at Dry Creek Preserve on Saturday, Nov. 18, for our Big Tree Blowout. We've moved back the day of the sale to make sure we have the best stock available to you. The plant sale will run from 9 a.m. to 1 p.m. Sales on big trees will be the special of the day, including incense cedars, valley oaks and Western redbuds. Get some beauty and shade for your yard, with the benefit of trees that don't need much water once established. This sale is a big one, we really want to clear out our tree inventory, as these trees are getting large and taking up space. So 15-gallon size valley oaks, Western sycamore, and Western redbud will be on sale for just $25 - a big savings off our regular price of $75. Five-gallon sycamores will be just $10, regularly $25. And we'll have our usual great selection of other native plants available for purchase as well. Dry Creek is located east of Visalia and Exeter. Take Hwy. 198 to Hwy. 216 and head north (on the left). Once over the bridge, turn right onto Drive Creek Drive, and the preserve will be 2.5 miles on your right. There's lots of parking, real bathrooms, and gorgeous scenery, come visit!